Having a thin and light, wonderfully portable laptop on the go, which docks with an eGPU for full power gaming fun when at home, is an appealing idea for some. However the pricing of successive Thunderbolt 3 eGPU boxes has always seemed rather high for what you get. Now Gigabyte is stepping in to make a more widely appealing compact eGPU product and it looks to do so with a more reasonable asking price. The Aorus GTX 1070 Gaming Box includes a pre-installed GeForce GTX 1070 graphics card, hence the name. Regular readers will know the GTX 1070 is a pretty good choice for mid-to-high end gaming setups and it delivers its promise with quiet and efficient aplomb. Its definitely a huge step up from integrated graphics often found in slim and light laptops and will do you proud if you also have a large QHD or even 4K monitor (with some detail/quality tweaks) on that desk at home. 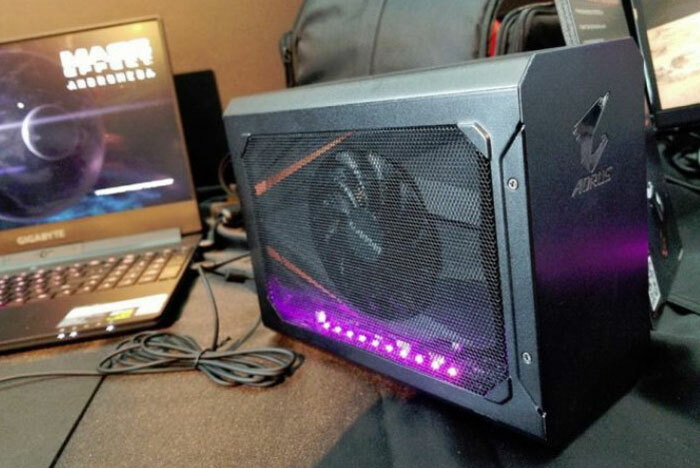 In its report from Computex, Anandtech notes that the Aorus GTX 1070 Gaming Box is pleasingly compact. Comparing it to previous leading designs such as the Razer Core and the Alienware Graphics Amp, Anandtech reckons it's about half the height and length of those competitors. That is likely down to those rival designs having the ability to fit basically any graphics card available on the market. Gigabyte / Aorus instead makes the Gaming Box just big enough for its single fan compact mini-GTX 1070 design. In the future you would only be able to upgrade to other mini-GPU designs. In addition to the ports supplied by the GPU backplate (2x DVI, 1x DP, and 1x HDMI), the Gaming Box offers 4x USB 3.0 ports and the essential Thunderbolt 3 port to connect to your laptop. In another report I read at NotebookCheck, it said that you don't get Thunderbolt 3 power delivery support with this product. Lastly, to mull over the pricing, which is key for any product success. 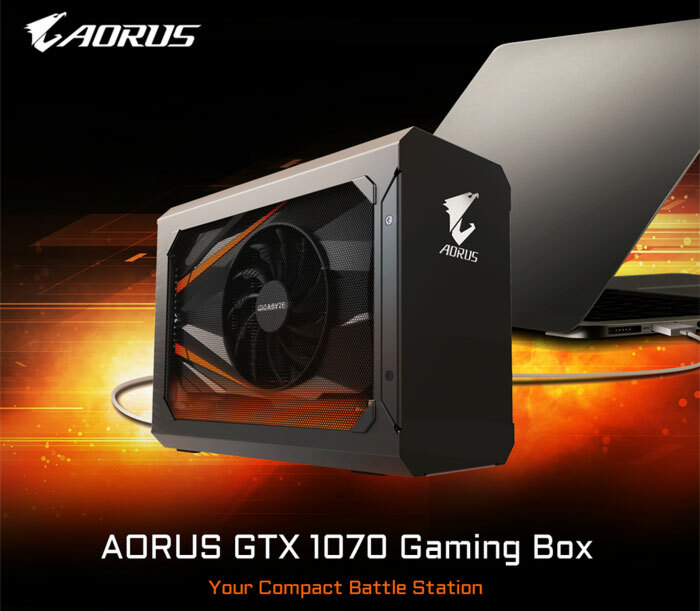 The Aorus GTX 1070 Gaming Box RRP of $599 includes the pre-installed ($400-ish) GPU making it about a $200 product if you would be installing a GTX 1070 anyway. According to Anandtech, that's about $100 cheaper than its cheapest competitor - not bad. You should be able to buy the Aorus GTX 1070 Gaming Box later this summer. It still feels like a lot for what is basically a low end PSU and a thunderbolt chip. But it's a step in the right direction that's for sure. Other than it's a niche product I don't see why it's so much either. £50 would be more like it, excluding gpu. That, plus the laptop's fan keeping the CPU cool when it's running at full pelt? Considering you can't upgrade the card for a longer one it seems particularly ridiculous to me. It seems like just getting a full desktop is more cost effective for what you get even if you do pay more. I like the idea, but It seems silly to pay such a premium for a glorified case and power supply.